Saint Padarn lived from approximately 490 a.d. To 550 a.d. and was said to be Aremorican, by race. Armorica is the name given in ancient times to the part of Gaul that includes the Brittany Peninsula and the territory between the Seine and Loire rivers. Petran, his father, and Guean, his mother, curiously and as soon as he was born, dedicated themselves to Christ and piously separated. Padarn, inquiring of his father's whereabouts, decided to follow his example and followed a devout life of fasting, prayer and meditation. 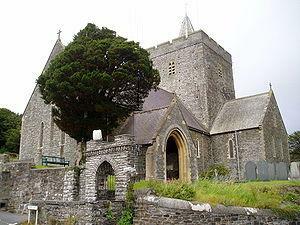 A native of France’s Bretagne region, Padarn journeyed to the British Isles, and settled in Wales as a monk. He founded a monastery at Llanbadarn Fawr, near to Aberystwyth, which became the seat of a new diocese, with him as its first bishop. Here is the present day Church of St. Padarn near Aberystwyth. Padarn served for twenty-one years in the episcopal office as a man of much prayer and self-denial who frequented the bedsides of the sick and preached the Gospel across the countryside. He is also said to have made a pilgrimage to the Holy Land and finally travelled to join his father in Ireland. His feast day is 15th April.